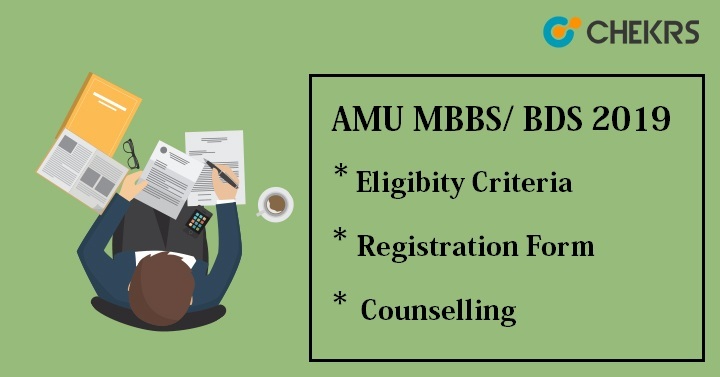 AMU MBBS 2019: Aligarh Muslim University (AMU) 2019 MBBS admission will start after the result announcement of NEET 2019. On the basis of marks secured in NEET examination, students get admission into the medical colleges of AMU. No separate Medical Entrance Exam will be conducted for MBBS & BDS admission. Medical Counselling Committee (MCC) will organize the admission process of AMU MBBS / BDS. Aspirants who want to take admission for MBBS or BDS course must register them on the official site of MCC after the commencement of application form. NEET-UG Counselling will begin in the month of June. Candidates, who will apply for NEET 2019, can register them for AMU NEET UG MBBS / BDS. Candidate must check AMU MBBS Eligibility Criteria for the AMU MBBS 2019 Admission. Here we have mentioned the criteria of AMU 2019.check it before appearing for the AMU NEET-UG Admission 2019. Candidates should have secured minimum 50% marks in subjects PCB with English. Candidates who studied for last 3 years from AMU can apply for AMU MBBS /BDS. CBSE will conduct NEET examination in the month of May, after NEET result declaration in June. AMU will offer admission for the various medical courses on the basis of NEET score. No application form will be published by the authority of AMU, but for admission in AMU MBBS/ BDS, candidates have to register them at the official site of MCC. AMU MBBS 2019 Application Form will be filled online. Candidates who want to take part in final mop-up round of counselling, can registered on the AMU official site i.e. www.amucontrollerexams.com. Final Mop-up round of counselling will be conducted by AMU, as vacant seats will be transferred to the university. Select UG Medical Counselling. It will redirect to next page. For new user, click on New Registration, enter the details. Already registered user can click on candidate login, Enter Roll no & Password. After registration, Fill the choice filling form and then lock the choices. AMU MBBS Cutoff will be the minimum required qualifying marks obtained by the candidates to get admission in AMU Medical College. It will be announced by the official authority of AMU. On the basis of cutoff marks, merit list will be prepared. Merit list will include the name of candidates who obtained the released cutoff & eligible for the AMU MBBS Admission 2019. AMU MBBS 2019 Merit List will be prepared on the basis of NEET-UG score. It is mandatory to score minimum required percentile for AMU MBBS/ BDS Admission 2019. AMU will be responsible for releasing the AMU NEET-UG Merit List. Based on the merit list students will be called for counselling process. It will contain the name of candidate who scored the required percentile with their application no, NEET score, NEET rank & Category. AMU 2019 Counselling will be started in the month of June. No separate counselling will be organized for AMU. AMU MBBS Counselling will be held along with all Deemed & Central Universities. Counselling will be conducted through online mode only. To take part in the counselling procedure, all eligible candidates have to register for the counselling round. Candidates who will select AMU at the time of counselling will get admission in AMU for medical course. AMU NEET-UG Counselling 2019 will be performed in many rounds. First Round Seat Allotment list will be released and then students have to report at the allotted colleges. Vacant seats AIQ will be transferred to the University.